سلیمانی کرمانی, محمد‌رضا. (1397). بررسی روش‌های مختلف مکانیکی احیا کردن مقاومت لغزشی سطوح صیقل یافته بتنی و تعیین جایگاه استفاده از آنها. 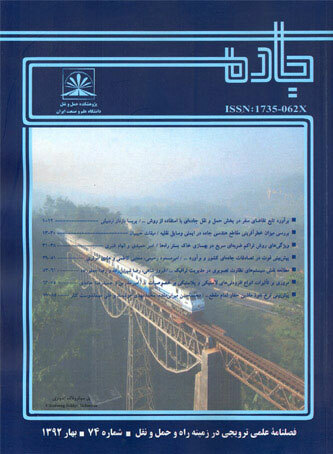 جاده, 26(97), 41-54. محمد‌رضا سلیمانی کرمانی. "بررسی روش‌های مختلف مکانیکی احیا کردن مقاومت لغزشی سطوح صیقل یافته بتنی و تعیین جایگاه استفاده از آنها". جاده, 26, 97, 1397, 41-54. سلیمانی کرمانی, محمد‌رضا. (1397). 'بررسی روش‌های مختلف مکانیکی احیا کردن مقاومت لغزشی سطوح صیقل یافته بتنی و تعیین جایگاه استفاده از آنها', جاده, 26(97), pp. 41-54. سلیمانی کرمانی, محمد‌رضا. بررسی روش‌های مختلف مکانیکی احیا کردن مقاومت لغزشی سطوح صیقل یافته بتنی و تعیین جایگاه استفاده از آنها. جاده, 1397; 26(97): 41-54. روسازی های بتنی مانند رویه های آسفالتی با جریان ترافیک، تغییرات محیط زیستی، تغییرات جوی، آلودگی و ... به مرور زمان سطح مقاومتی لغزشی خود را در طول عمر مفید خود ازدست می دهند. علت بسیاری از حوادث جاده ای و بزرگراه ها، به ویژه در شرایط مرطوب، زمانی که کمبود گیرش تایر و سطح می باشد اتفاق می افتد. سطح جاده همیشه باید دارای بافت مناسب باشد که شامل هر دو بافت ریز و بافت درشت می شود. کلیه روشهای احیاء کردن مقاومت لغزشی با یکدیگر متفاوت هستند و انتخاب تکنیک همیشه باید بر اساس کیفیت و ماهیت خاص رویه مورد نظر انجام می شود. اکثر فرایندهای احیا کردن مقاومت لغزشی را می توان در هر زمانی از سال و در سخت ترین شرایط آب و هوایی انجام داد. این روشها می توانند به عنوان یک ابزار ترمیمی کوتاه تا میان مدت ​​برای تعمیر رویه های با ریسک بالا باشد و بسیاری از روشها قابل تکرار مجدد می باشند. این روش­ها دارای فرایند متفاوتی جهت افزایش مقاومت لغزشی هستند و انتخاب روش باید همیشه با توجه به کیفیت و ماهیت خاص روسازی انجام شود. در این مقاله، روش های مختلف احیا کردن مقاومت لغزشی رویه های بتنی معرفی گشته و مورد تجزیه و تحلیل قرار گرفته و محل استفاده مناسب از آنها توصیه شده است. -حسنی، الف.، (1388)، "دستورالعمل طرح، اجرا و نگهداری روسازی بتنی"، معاونت آموزش، تحقیقات و فنآوری-پژوهشکده حمل و نقل. -Ackerman, J. D., Cottrell, C. M., Ethier, C. R., Allen, D. G., & Spelt, J. K. (1995), “A wall jet to measure the attachment strength of zebra mussels”. Can. J. Fish. Aquat. Sci., pp.126-135. -American Concrete Pavement Association (2017), “Diamond Grinding Shines in California and Missouri (Reprt)”. ACPA. 7.01. pp. 1–4. -Crisman, B.; Roberti, R. (2012), “Tire wet-pavement traction management for safer roads, Social and Behavioral Sciences 53”. -“Design Manual For Roads And Bridges Volume 7 Pavement Design And Maintenance Section 5 Surfacing and Surfacing Materials Part 3 Hd 38/97 Concrete Surfacing And Materials Amendment No. 1”, (1999). -Frictio, (2017), “A Guide to Road Retexturing, Benefits and applications of retexturing roadways and pavement. -Gransberg D.D. (2009), “Life Cycle Cost Analysis of Surface Retexturing with Shotblasting as an Asphalt Pavement Preservation Tool”. In Transportation Research Record: Journal of the Transportation Research Board, No. 2108, Transportation Research Board of the NationalAcademies, Washington, D.C., pp. 46–52. -Herman, L. A., Ambroziak, M. J., and Pinckney, E., (2000), “Investigation of Tire-Road Noise Levels for Ohio Pavement Types”. In Transportation Research Record: Journal of the Transportation Research Board, No. 1702, TRB, National Research Council, Washington, D.C., pp. 57–62. -Home, W. B., Safety Grooving, (2015), “Hydroplaning and Friction. Technical report prepared for the International Grooving and Grinding Association”. New York, NY, International Grinding and Grooving Association. -KLARUW, Cmpany Manual, (2017), “Systems Maintenance Options Retexturing Methods Practical Applications Considerations” United Kingdum. -Mosher. G. (2016), “Results From Studies Of Highway Grooving And Texturing by Several State Highway Departments”, Clipper Manufacturing Company. -NCHRP Web Document 53 (Project 6-14), (2002), “Contractor’s Final Report Feasibility of Using Friction Indicators to Improve Winter Maintenance Operations and Mobility”. -Nehme, Jean (2017), "About Long-Term Pavement Performance". Federal Highway Administration. Retrieved. -Rao S., Yu H.T., Darter M.I., (1999), “The Longevity and Performance of Diamond-Ground Pavements”, Research & Development Bulletin RD118, PCA. -Roe, P.G. S.A. Hartshorne Doc, (1998), “Mechanical Re-texturing of Roads: An Experiment to Assess Durability (TRL 299) (TRL Report)”, ePub eBook. -Soleymani Kermani, M.R. (1995), “Mechanical Re-Texturing of Road Surface Aggregates, Ph.D. Thesis in the Queen Mary and Westfield College, University of London. -Wladyslaw Gardziejczyk &Pawel Gierasimiuk, (2016), “Influence of texturing method on tyre/road noise of cement concrete pavement”, International Journal of Pavement Engineering Journal, Published online. -Wilson, D.J. and Dunn, R. (2005), “Analyzing Road Pavement Skid Resistance”. ITE Annual Meeting and Exhibit Compendium of Technical Papers, Melbourne, pp.16-17.